The base year selected for monitoring trends in wellbeing is 1994, the year the National Population Health Survey began. In the Index Report, we update trends until 2014, which is the most recent year for which the latest full set of data across all eight domains are available. The indicators used in the index are drawn principally from data sources provided by Statistics Canada. National surveys conducted over time from which data are drawn include the Canadian Community Health Survey, the Labour Force Survey, various cycles of the General Social Survey (e.g., Time Use, Social Networks and Identity, Victimization), Travel Survey of Residents of Canada, and the Survey of Labour and Income Dynamics. Indicators also are drawn from data sources provided by Environment Canada, the Board of Internal Economy, Elections Canada, and Parks Canada. Finally, selected indicators have been provided by independent groups and organizations such as the OECD, the Global Footprint Network, CIBC, Canadian Centre for Economic Analysis, and the Childcare Resource and Research Unit. Within the sections describing trends in the indicators for each domain, the data are reported in the original units of measure (e.g., percentage of the population, expenditures in constant dollars from a base year, average time in minutes, and so on). Some indicators are positive in nature, so if the trend is upwards, the indicator is contributing to quality of life. For example, life expectancy in Healthy Populations, average monthly participation in physical activity in Leisure and Culture, and average tax median income in Living Standards are all positive indicators showing upward trends so have all been contributing to our wellbeing since 1994. Similarly, if a positive indicator – such as the percentage of population with five or more close friends in Community Vitality – is showing a downward trend, then it is having a diminishing affect on our wellbeing. Other indicators are negative in nature, so if the trend is upwards, the indicator is lessening quality of life. For example, increases in the incidence of diabetes in Healthy Populations, housing affordability in Living Standards, and annual average undergraduate tuition fees in Education have all been detracting from our wellbeing. Conversely, declines in the Crime Severity Index in Community Vitality, the gap in percentage turnout between older and younger voters in Democratic Engagement, and residential energy use in Environment reflect contributions to our wellbeing within those domains. With many of the indicators measured in very different ways, a first step is to set each indicator to a value of 100 at the base year. Percentage changes are then calculated for each subsequent year thereby allowing for direct comparisons between indicators and domains. All indicators are weighted equally. Some have argued that one or another indicator is more important, but what is missing is a universally agreed upon reason for assigning any particular indicator a weighting greater or less than that of some or all other indicators. The absence of such a reason justifies the equal treatment of all indicators at this time. Throughout the report, trends for the eight domains are presented and specific indicators highlighted to reflect how Nova Scotians’ quality of life has changed – for better and for worse – over the 21-year period from 1994 to 2014. In addition, comparisons are made to the rest of Canada. The domains are presented in the order reflecting how well we have progressed since 1994 – from the greatest increase in Education to the continuing deterioration of Leisure and Culture. Of the 64 indicators reported in the CIW national report, “How are Canadians Really Doing?”, 60 are available and used in this report of Nova Scotia Quality of Life Index (NSQOLI). The four indicators not reported were either not available for Nova Scotia or had been suppressed due to confidentiality concerns. One indicator within the Education domain (i.e., average expenditure per public school student) and three indicators within the Environment domain (i.e., Ecological Footprint, primary energy production, and Viable Metal Reserves Index) are not available. 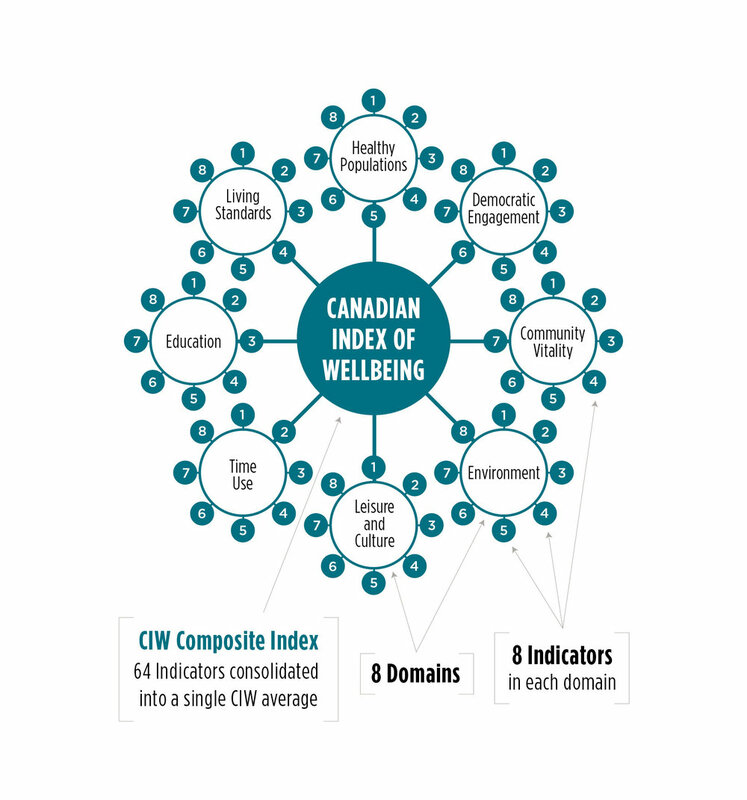 Consequently, the composite indices for these two domains and the CIW index were re-calculated for the national data excluding these four indicators to allow direct comparison with trends in Nova Scotia. With these refinements to the national data, trends in the Education and Environment domains as well as in overall wellbeing for Canada differ slightly from the trends in the 2016 national report.